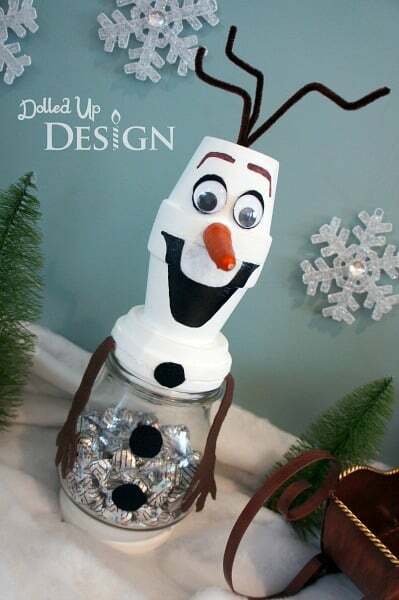 This Olaf Craft post is courtesy of our contributor Chantelle…Who doesn’t love Olaf? I am so excited to bring you my first party tip post today starring the quirky little snowman. Frozen still seems to be going strong as a party theme all over Pinterest and on my favorite party sites, so I decided to work on a Frozen inspired project to share with you. 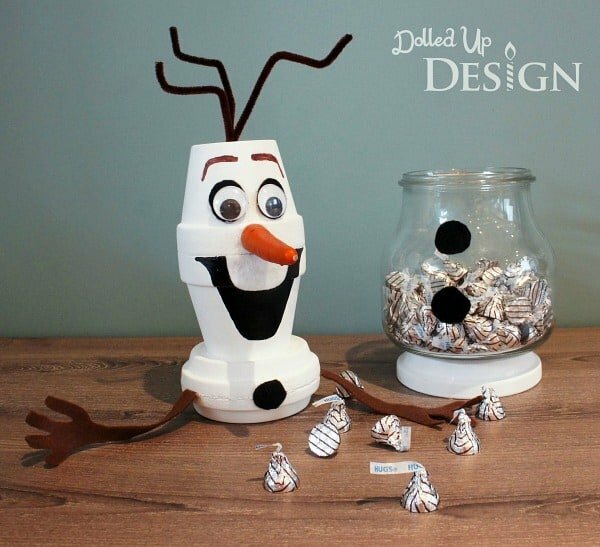 If you have plans for a Frozen inspired sweets table or are looking for a fun gift idea for the Frozen lover in your life, you’ll definitely want to read on! I am not quite sure how it popped into my head, but one day I realized that the distinctive shape of Olaf’s head looks an awful lot like two flower pots stacked on each other. 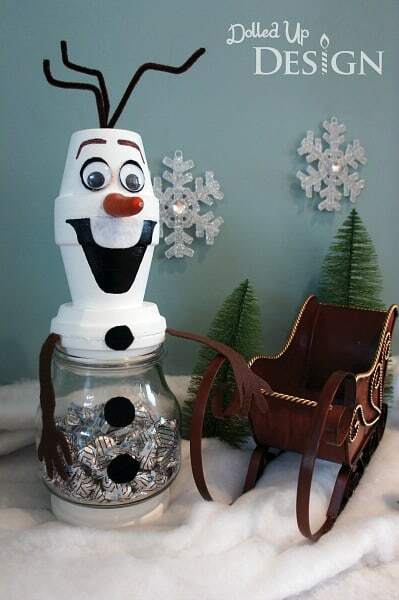 I have had it on my project list to go buy some terra cotta pots and a round glass vase to make one of those cute bubble gum machine candy jars, but decided instead to use those same materials and make a fun Snowman shaped treat jar instead. Begin by painting all your terra cotta pots and saucers white. I chose to work with a brush and bottle of acrylic paint, but you could easily spray paint the pieces as well. 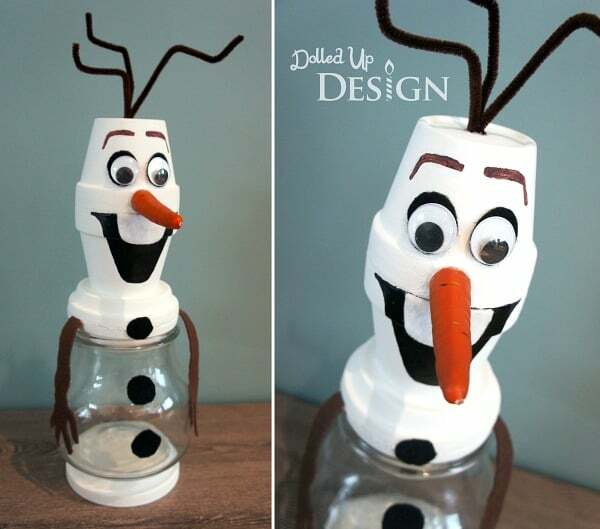 Using Gorilla Glue, glue the two painted pots open end to open end, to create Olaf’s head. Set aside to dry. Cut out your felt shapes including a white tooth, two brown arms, 2 black ovals to mount the googly eyes on, and 3 black buttons. Using a black sharpie, outline the mouth and fill in with the black acrylic paint. Glue the two smaller sized Terra Cotta saucers together with Gorilla Glue, sandwiching the brown felt arms in between. Attach the head shape to the top center of the saucer stack with the Gorilla glue. 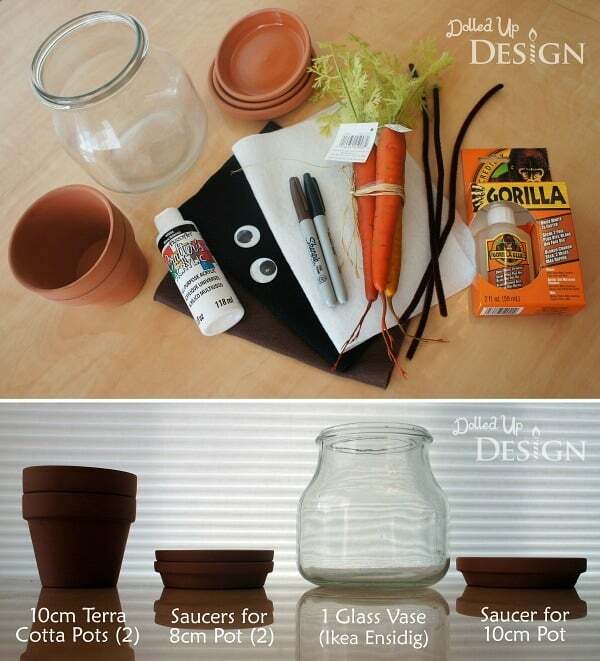 Glue the glass vase to the larger painted saucer to create the base/feet. 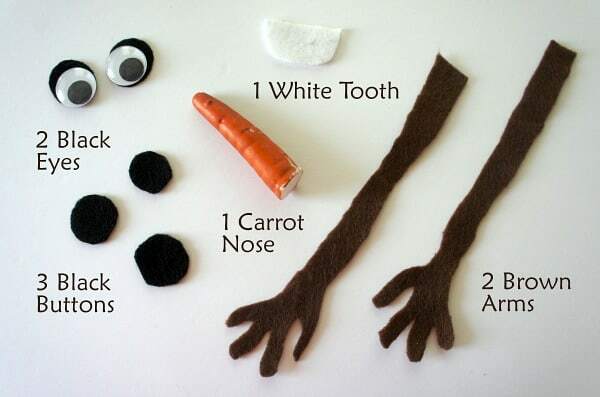 Use a hot glue gun to attach the buttons, tooth, layered eyes, and carrot nose. I used a foam carrot found at Michaels, but you could certainly create your own from rolled felt or foam. Orange Crayola Model Magic might also work well to sculpt a carrot nose. Draw eyebrows on using a dark brown permanent marker. Hot glue pipe cleaners into the top of the flower pot head and bend randomly to look like twigs. 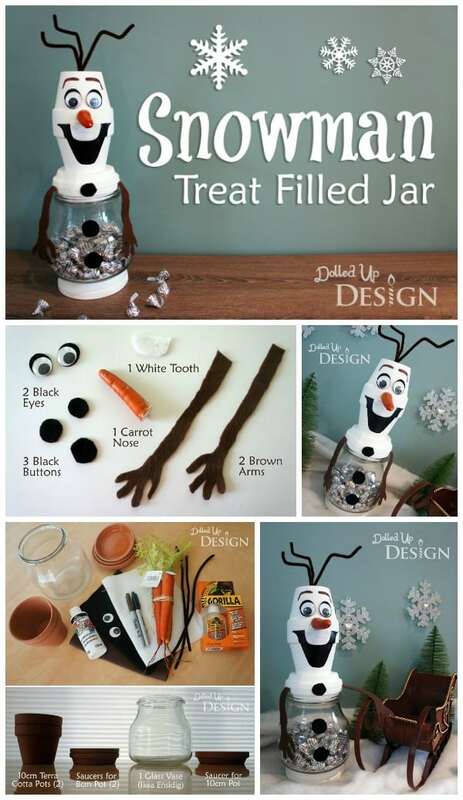 And what does one fill an Olaf inspired treat jar with? Why, Hugs, of course! This was an easy project to pull together and fairly inexpensive given that I was able to find most of my pots and craft supplies at the Dollar Store. The IKEA vase used can certainly be substituted with any other glass or plastic jar – just play around with the flower pot saucers to make sure you find a size that will fit snugly in the top of your container. I hope you all like the final Snowman as much as my kids and I do! It is hard not to love something that is this adorable AND full of chocolaty treats. And I do apologize if you have gotten a certain snowman-building song stuck in your head from reading this post. Can’t get enough Olaf? 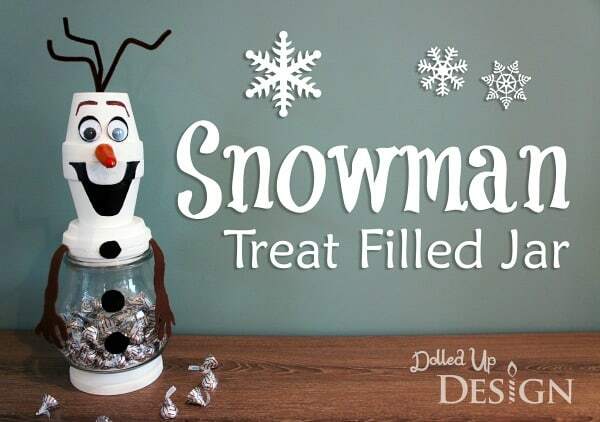 Check out this adorable Olaf-inspired party favor idea by Chantelle – free printable included! We’d like to send a huge THANK YOU to Chantelle for sharing this creative tutorial with us. There are a lot more where this came from – visit her on Facebook to see the latest ideas for fun crafts, party ideas and more! This is so adorable! Such a cute idea, Cheryl! I added a pipe cleaner to the backside of his arms. This way you can pose them. That’s such a clever idea, Cindy! Just what I need. My christmas theme this yr. Is frozen. This is perfect for that theme! This is great! I made one tonight but I have two questions, 1. Where did you find the carrot? and 2. Where did you find 8cm saucers? I can only find 10cm or larger. Thanks! 1) I found the carrot at Michael’s craft store. It was in the floral section in among some other fake produce such as apples and pears. As mentioned, you could also sculpt one easily from Crayola Model Magic or Fimo if you can’t find the same one I used. 2) I found all my pots and saucer’s at Dollarama. 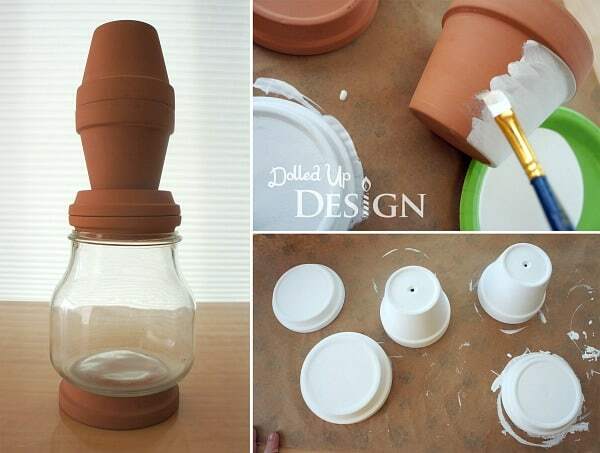 I have noticed that both Home Depot and Walmart have a good selection of terra cotta pots so you might try there. Hopefully this helps and you can get your snowman built! I absolutely love this! (I’m quite the Olaf fan.) 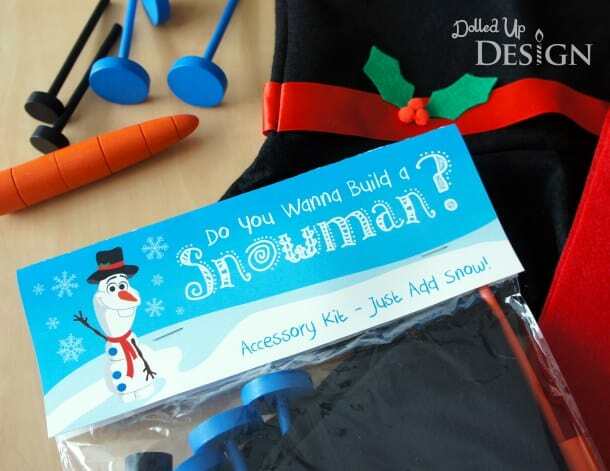 Would you mind if I use this in a snowman craft roundup on One Creative Mommy? Hi Heidi! We’d love to be featured – thank you for asking. Please only use one photo with a link back to this article. No part of the tutorial should be copied onto another site. Please credit both Moms & Munchkins and the tutorial creator Dolled Up Design. This is such a cute candy dish! May I use this pattern to make and sell and some craft shows as long as I reference both Moms & Munchkins and the tutorial creator Dolled Up Design? Yes, definitely go ahead and use the pattern. I love to see my ideas being used and enjoyed by others. I know some people just aren’t crafty and would never attempt this on their own, so selling them at a craft show is probably a great idea. 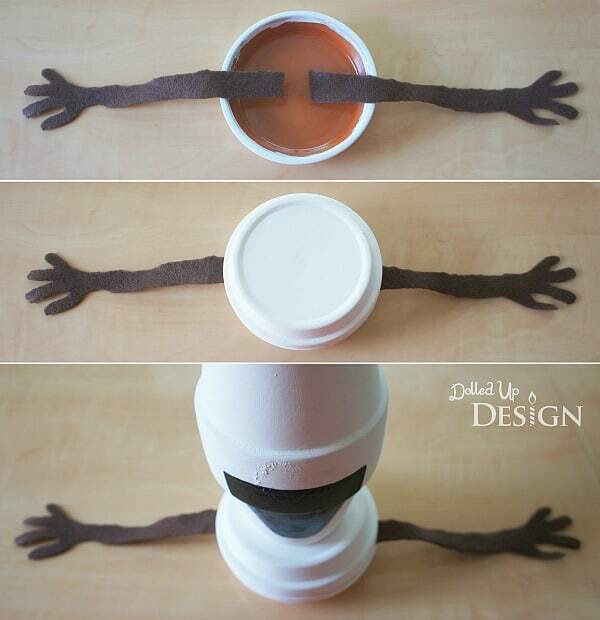 I believe i’ll experiment with substituting styrofoam cups for the kids to make and use playdough for a nose. I do like the posable arms too. I love it.I might try to do it. This is so cute. And looks simple enough to do. I see you posted it last year. But Kitchen Fun with My 3 Sons just reposted to FB today. I may have to try this soon. Thank you for visiting, April! 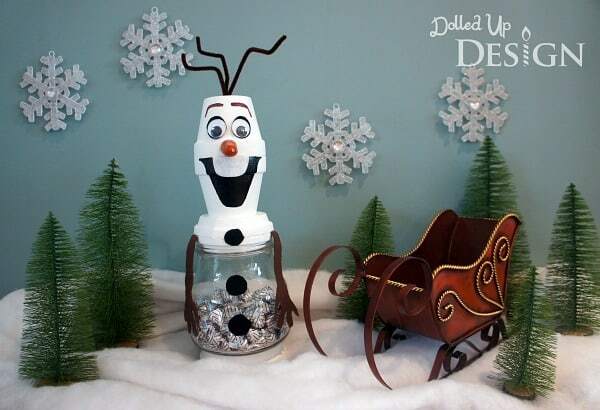 Good luck with your Olaf project! This is a very cute idea. Besides IKEA where would you find a vase like that? Hi Ann! You could try your local dollar store as well. You would have to lift 2 terracotta pots & 2 saucers to get the candy out. This is alot of weight to lift, especially for a child. Am I misunderstanding this something?